Our society is constantly changing. Recently especially the rise and spread of new technologies such as the internet has left their mark on today’s world: people have easy access to an abundance of data and the possibility to share their own information with almost the entire world with nothing but a small gadget which conveniently fits into their jeans pocket. Be it as an answer to shortcomings in the professional journalistic field, be it due to the simple human urge to participate in and shape the world around him: Utilizing the possibilities of our increasingly connected community, in the last years citizen journalism has emerged as an alternative, and by now already somewhat important form to accumulate and report on news. But while some scholars such as Bauman affirm that our increasingly complex and liquid modern society naturally makes a rethinking of the journalistic profession necessary, independent amateur journalists operating outside the mainstream media institutions nevertheless still encounter massive distrust and antipathy – especially out of the lines of their professional colleagues. I believe, falling in line with an increasing number of renown news institutions which are willing to give a liaison with citizen journalists a chance, that citizen journalism can actually be a great enrichment to our media landscape. Rather than seeing it as an assault on their class, professional journalists should embrace the opportunities of collaborative projects and the new diversity of news it implies. 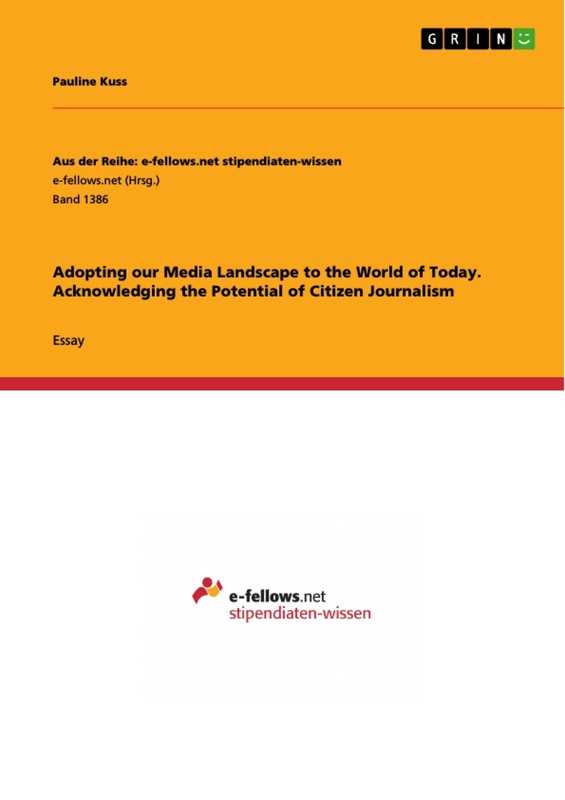 By acknowledging an increased involvement of citizen journalists, our media landscape could give a greater number of people the platform to tell their stories and to shine a light on issues which might otherwise be left unseen – upholding democratic values and fostering their spread throughout a world which is not only as complex but also as interconnected as never before. Be it due to a general human leeriness towards new developments, be it because of a resisting brigade of professionals trembling for their societal importance – citizen journalism still faces widespread skepticism which questions not only its trustworthiness and objectivity but furthermore assails its quality and the missing skills and standards of non-trained authors. “A trustworthy press is the immune system of democracy” – but how trustworthy are articles written by amateur authors without a fact-checking editor and liable news organization behind them? In October 2008 a story published on CNN’s iReport reported that Steve Jobs had suffered from a sever heart attack. The author’s source wanted to stay anonymous and he himself had “no further information” on the event. Nevertheless did the story, which eventually prove absolutely unfounded, negatively effect the Wall Street where Apple stocks took a temporary 10-point-dive. One might thus share Singer’s skepticism when she refers to professional journalists as “sense-makers”, needed more than ever in our information age to “sort the wheat from the chaff”. The spread of the internet surely provides a growing number of people access to a great amount of information – maybe an amount so great that one easily looses themselves in the overwhelming jungle of data. On the other hand does the spread of easily accessible information also allow a growing number of people to independently and immediately fact-check the news they receive. Of course should information published as news be correct and an additional fact-check thus unnecessary. I however believe that, being a rather novel phenomenon, citizen journalists are subject to disproportional scrutiny. Professional journalists who feel threatened in their position excessively highlight single canards effused by their inferior emulators such as the one mentioned above. It should not be forgotten that some trusted colleagues of their own ranks have proven just as unsound in their claims in the past, as the recent suspension of NBC News anchor Brian Williams based on false assertions related to the 2003 Iraq invasion demonstrates. Another often heard accusation concerns the missing quality in news pieces written by non-professional who did not enjoy specific education in the field. When asked, a vast majority of professional journalists perceive themselves distinct from their non-trained imitators through a specific set of skills ; especially doubts concerning sufficient knowledge of the methodology or ethical and legal aspects related to the profession are raised. Francine Bardoel, chief editor of “Universe” who worked with citizen journalists for a TV-project for VPRO remembers “Citizen journalists made a lot of material while professionals can better distinguish the importance of footage.” But is the ability to tell relevant and trivial news items apart not merely a matter of experience and practice than of a graduating diploma from the journalist school? And what about the lone voice of one reporter who admitted in the survey mentioned above that the skill of shorthand can be picked up and a copy of the media law book can be bought – leaving no insuperable difference between the two groups and thus questioning the existence of a great difference between professional and citizen journalists ? Professional journalists might not want to hear it, but in times where everyone can look up legal provisions on the internet, follow a short-cut training in journalism, and even renowned news organizations such as the New York Times offer open classes for citizen journalists, the argument of possessing distinguishable skills as an exclusive feature of those with a degree, has to back down. So while citizen journalists do not necessarily miss the skills to deliver good-quality work, many critics question their objectivity. Being often involved in the reported events themselves or trying to promote their own opinion rather than objectively describing the circumstances would undermine the impartiality of the press and its mission to highlight the truth. But what is this truth anyways? And how can professional journalists have any greater claim to objectivity when they use methods like priming, agenda setting or framing, bending the facts and figures until they fit their intent ? Yes, authors coming directly from the lines of the population might be more personally involved in the matters they write about. But besides acknowledging that every journalist is alongside his profession a citizen as well, holding just as many opinions and feelings about societal occurrences, a greater connection with those concerned can also be listed as one of the great advantages of citizen journalists! Seeing the rising complexity of today’s societies, the valued detachment of journalists from society might fall short in meeting the increasing need for multicultural sensibility and lead to a disconnected or oversimplified portrayal of the social complexity of modern times. However, does the lack of accountability also imply a great freedom. Pavlovic: “The main advantage for citizen journalist would be that they do not depend on anyone.” No one commands citizen journalists what to write about or in which light they have to portray a certain event. 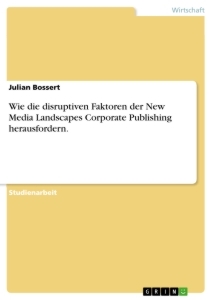 They are totally independent from higher motives of news organizations such as possible commercial interests or political affiliations of the publishing house. Especially in undemocratic countries, in which true freedom of the press is still nothing but a charade, non-accountability does furthermore enable an escape from censorship – making citizen journalism a valuable stimulator for democratic development and a fast lane towards international attention as examples such as the Arab Spring in 2011 demonstrate. But I believe that the advocacy of citizen journalism can go well beyond the mere refutation of faced accusations. In today’s technology age where information exists in abundance and can be shared and distributed around the globe in seconds, the participation of normal citizens in reporting on what is going on around them is not only an unstoppable development but can furthermore bear great potential to enrich the media landscape as we know it. Increased individualization in our Western world brought about a fragmentation of the media audience and an overall increase of existing opinions. Research shows that nowadays, people do not only want to be passively informed by the media but rather be actively involved in the news-making process. Uncorrupted by economical motives or market demands, citizen journalists can freely choose the issues they want to cover; what they believe the audience should be seeing and which otherwise might be left unreported. As previously mentioned does the engagement of reporting citizens in the Arab Spring greatly illustrate how citizen journalism can foster the democratic process in countries with a controlled media, showing the world a possibly subjective but nevertheless frighteningly real version of “the truth”. And while publications by Transparency International show that investigative journalism is believed to be the most efficient tool to fight corruption, even outplaying national anti-corruption laws, the democratic nature of citizen journalism is not restricted to oppose corrupt or undemocratic political regimes. The pure act of involving an increased number of people in the news process and thus representing a growing amount of voices is a very democratic process in itself! As stated before, we are living in an increasingly multicultural society which implies that one common version of the truth is less attainable than ever. And while the objectivity of single authors might be criticized when he is directly concerned by the matter he reports on, you might also argue that the “multiperspectival reading of events” by various actors of society will de facto provide “multiple interpretations of objectivity” which, when consolidated, will leave the audience with a multifaceted interpretation; maybe the closest to any truth possible. 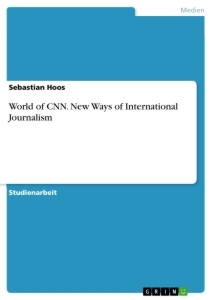 Besides allowing for the instantaneous spread of information around the globe, the rise of the internet did furthermore lead to an unprecedented interconnectedness, which in turn demands news organizations to cover the most current happenings 24-7. Faced with this increasingly faster society, news organizations might be prevented from providing more diverse content since inclusiveness and depth can easily be lost in the constant struggle against demanded speed, while the immediacy of citizen journalists, who often report from the spot right away, remains simply unachievable by conservative means. Projects introducing collaborations between a professional news organization and citizen journalists, have shown that such a constellation can indeed prove very beneficial for the media house: handing some of the workload over to non-professional authors saves not only money but also time! Consequentially, more matters can be covered, overall making the content of the newspaper broader and more diverse and thus more appealing to a greater audience. Having more time for the important matters, professionals who are willing to embrace the potential of citizen journalism and cooperate with amateur authors, might thus very well be able to increase their performance on hard issue news reports, which appear to mostly still remain exclusively in their responsibility. Citizen journalism does thus not only inspire a new variety in the media landscape but could furthermore lead to greater quality overall. What remains is the insight that the issue of citizen journalism vs. professional journalism might not be a question of one or the other. It is the insight that both forms of reporting do undeniably come with their own benefits: It is a struggle between great immediacy, involvement of the public and broader coverage abilities on the one and trusted accuracy, credibility and easier access to hard news issues on the other side. So why not embracing the qualities citizen journalism has to offer instead of degrade the movement in its baby shoes already? Why not giving it some time; giving the individuals involved some time to prove themselves and develop means to ensure the accuracy of citizen journalists’ work on a larger scale? Credible news are about trust and trust needs time to develop. Due to the fact that more and more people want to engage in the news process and it is easier than ever to do so, the increased involvement of citizens reporting on the world around them is unavoidable anyways. Thus, let us not waste our time trying to argue why it should or should not happen – it will happen anyways. Let us spend our time instead thinking about possibilities to get the greatest out of this new development; to build bridges between professional and citizen journalism and thus allow the newcomers the experience and practice they need to live up to the high standards of quality journalism the public is demanding. Singer, J.B. (2010). Quality Control: Perceived effects of user-generated content on newsroom norms, values and routines. Journalism Practice, 4(2), 127-142. Canter, L. (2013). The source, the resource and the collaborator: The role of citizen journalism in local UK newspapers . Journalism, 14(8), 1091-1109. Goffman, E. (1974). Frame analysis: an essay on the organization of experience. Harper & Row. Deuze, M. (2005). What is journalism? Professional identity and ideology of journalists reconsidered. Journalism, 6(4), p.455. 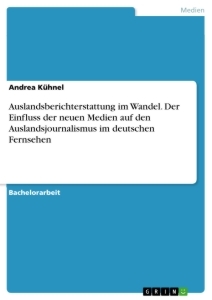 Lindner, A. 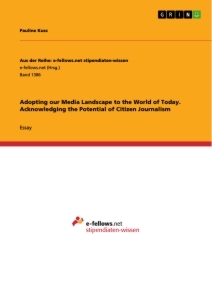 & Connell, E. & Meyer, E. (2015) Professional Journalists in „citizen“ journalism. Information, Communication & Society, 18(5), 553-568.
 both: Deuze, M. (2005). What is journalism? Professional identity and ideology of journalists reconsidered. Journalism, 6(4), p. 456.